This is such a wonderful arrangement! What a fantastic looking little garden nook you've created.! Definitely magazine worthy. Ohh, lovely. Is this your garden? Do you live in Italy? Lovely to see some different garden. Yes, this is my little garden. I can't boast having acres of land but I am very happy with my little corner of rocks and earth. And of course I am so lucky to have miles and miles of valley to enjoy as I do my knitting on my bench, with endless cats at my feet. Amazing.What zone do you live in? 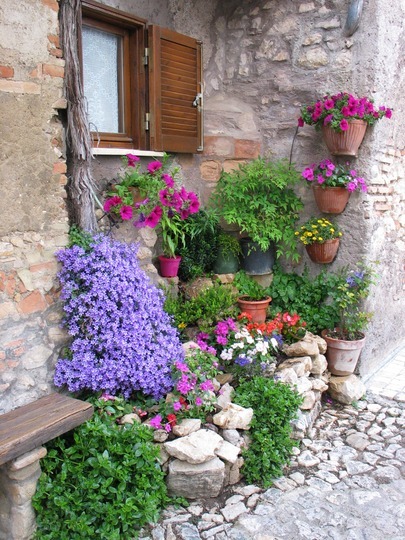 Who did all the wonderful rock work below your nook garden? I love mixing rocks and flowers.I'm teaching myself to build rock walls since we live on ledge. enchanting though!! Missed this lovely pic. first time around..
sorry, it was at a time when I wasn't able to look at GoY very much. A beautiful nook, I am glad to see all these appreciative remarks, it is nice for me to be able to agree with people sometimes... all these comments do bring out and increase one's pleasure. Thank you. I'm glad you all like it. It's not like this at the moment, as you'll see from my latest photo (apart from the campanula cushion), but hopefully I shall get some colour into it very very soon. I don't know when I'll ever get to your latest photo - I've got a long way to go ! If the bush with all the blue flowers is the campanula, then I must say I've never seen anything like it and I think it really makes this picture by adding all that blue to the reds etc. Thanks again - take your time - no rush !! Tiers are well done. Great job! what a lovely arrangement! do you have any probs getting to the back to water them? and what's the blue waterfall on the left, please?